Arrived at Airvault yesterday evening after a long drive from Le Havre. This afternoon I dropped my daughter Georgie at the station so she could catch a train to Paris for the weekend and then called in to the local Intermarché to stock up for the first week of campismo en France. I blundered around the over-stocked aisles until I came to the fruit and vegetables. 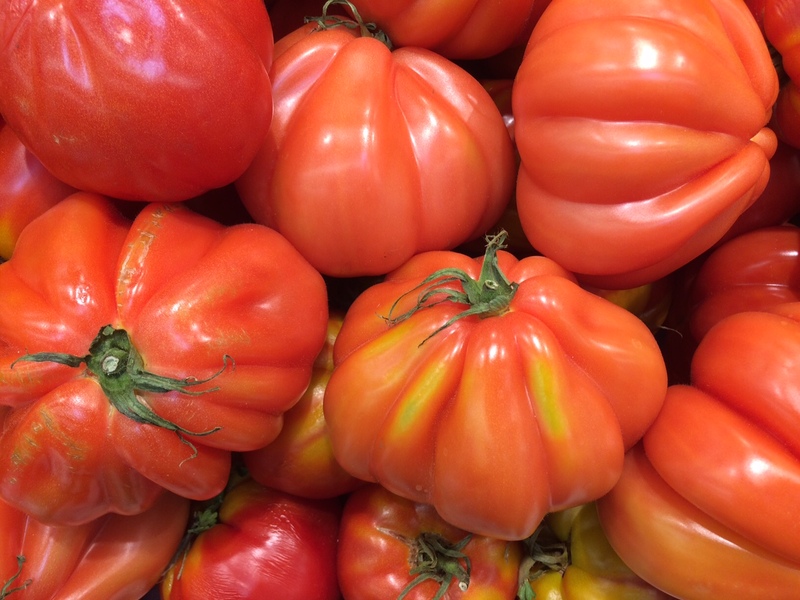 Suddenly I remembered how excited Chris would be at the abundance of fresh food in French supermarkets and instinctively reached for my iPhone to take a picture – as she would have done – of a display of enormous “coeur de boeuf” tomatoes. Local markets and village shops were her providers of choice, but she’d make an exception for a good Intermarché. And then it hit me: I was there alone. 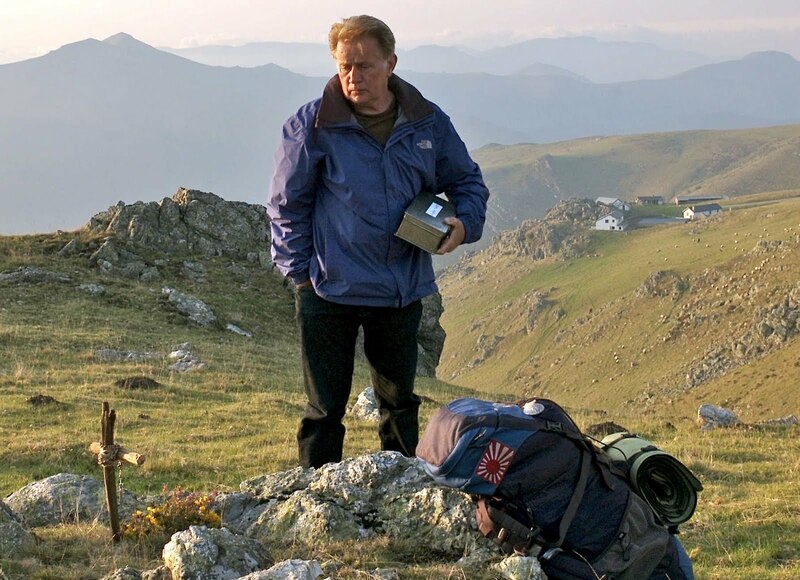 Everything – shopping, camping, life itself –was an adventure with Chris. Her curiosity and delight in the world were contagious. I carried on as best as I could: wine, apricots, cuisses de poulet, ham, cheese, croissants. The trolley got filled but I felt more and more empty. I was so distracted that I dropped a jar of olives. It smashed on the floor and I went to find an assistant to clear it up. Sorry. I rolled the final phrase around in my mind and I thought, that’s exactly how I feel. I’m not just sorry Chris isn’t here, I’m desolated: abandoned, thoroughly alone. Feeling quite miserable, I went out to the car park to load the camper van. Teddy pounced on me – as he always does –with unconditional delight. He wagged his tail and buried his face in mine. 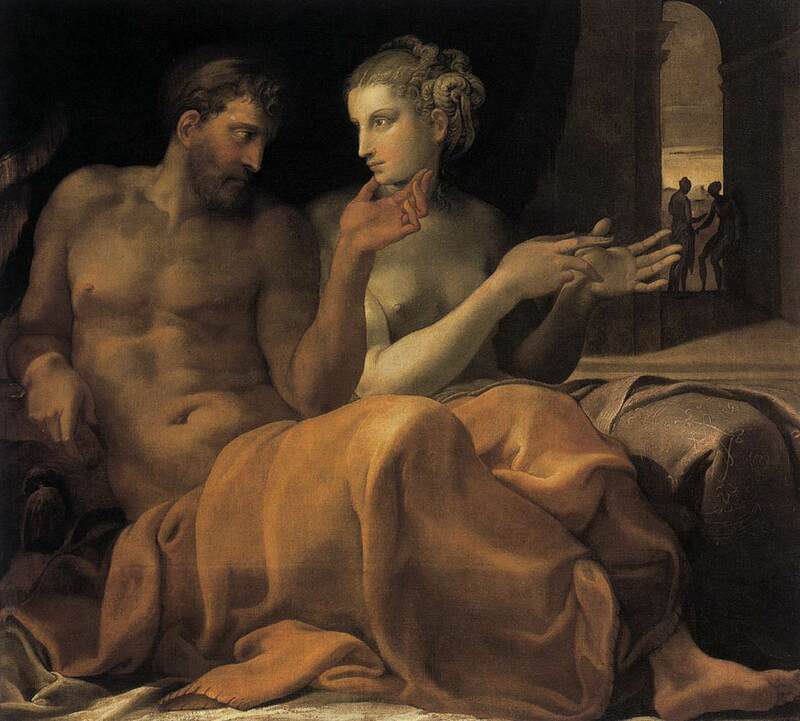 Homer’s Odyssey, that epic story of a man finding his way home in mid-life, ends with the hero’s return to Ithaka, where he is finally re-united with his wife Penelope. We are left to wonder what happens next: do they grow old together; do they rule the kingdom wisely; does he resume his adventurous wandering? It’s such a compelling story that it’s hard not to speculate. Many writers have: Nikos Kazantsakis, wrote a famous modern sequel (substantially longer than the original poem) in which Odysseus, bored with family life, travels the world and eventually dies in Antarctica having spent time with Buddha, Jesus and Don Quixote; Tennyson’s Ulysses rails against old age and calls his past comrades to journey with him once more: to strive, to seek, to find, and not to yield; Helen Luke, as an antidote to all this continued heroic striving, wrote a brilliant essay in which she imagined Odysseus maturing into old age alongside his queen. But none, so far as I know, have contemplated the possibility of Penelope dying young and leaving Odysseus alone and heartbroken. When Chris and I found each other (I don’t mean when we met but when, after a decade of struggle, we both decided to love each other at the same time) I knew that I had reached my Ithaka and that she was my Penelope. Within two years, Chris experienced the seizure that first alerted us to her brain tumour, and less than 18 months after that, by December 2014, she was dead. I had turned to the Odyssey many times in my middle years for inspiration, so the impulse to ask “what happens after Ithaka?” felt quite natural. Yesterday morning, I woke early with the urge to write a poem to seek an answer to that question. I had a hunch that a formal poetic structure would help me to explore whatever images arose so I decided to try a similar verse form to the one used by Tennyson who wrote his poem Ulysses in unrhymed iambic pentameters. Has sunk beneath the waves and gone from sight. No song, no wine, no stories and no dance. There’s nothing left of what he held so dear. A man without a mistress or a home. His grieving soul has lost the urge to roam. The very breath of life upon his face. A golden land beyond the trackless waste. This morning, I woke to the gentle shooshing sound of waves lapping the shore of the bay below my window. Leaning out over the terrace and looking up, I could just see the tiny whitewashed hut that is the church of Agios Pavlos (Saint Paul) perched on a ledge and, beside it, the shadow of a cave. 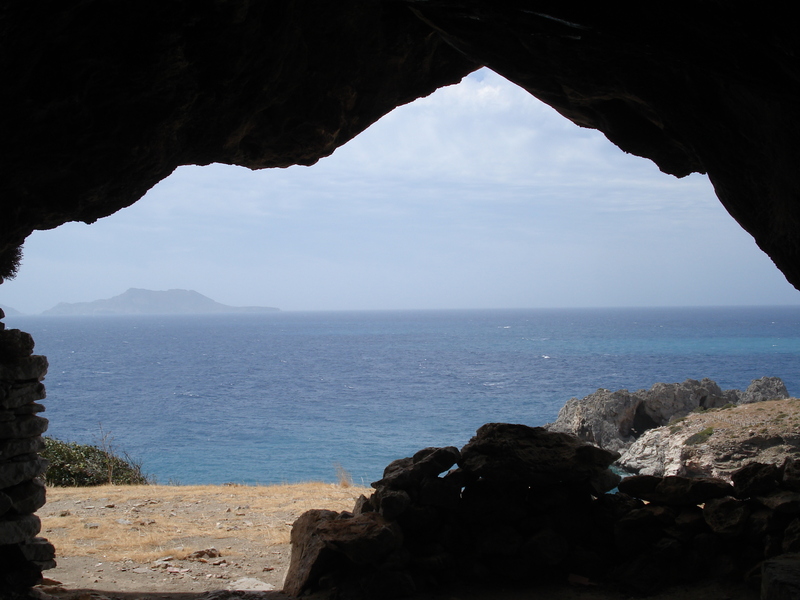 Chris had slept in the cave a few times when she came to Agios Pavlos for the first time in 2000. Her relationship with Mike had ended and she and I hadn’t yet got together though we knew each other as friends. She’d gone to take classes at the yoga centre there. She’d told me proudly how she’d travelled with just a backpack containing a toothbrush, a change of clothes, and a copy of Women Who Run With The Wolves. She’d arrived by ferry from Agia Galini and waded ashore, a latter day Aphrodite. After she died, I saw that she had written in her journal that it was one of the few times in her life when, as an adult, she had felt utterly free. I’d taken her back there a few years later as a 40th birthday present. She’d attended yoga classes each morning while I walked a couple of miles along the shoreline to Trio Petra, and back, more arduously, on circuitous inland tracks. In the afternoons, we’d dozed and swum and in the evenings we’d haunted the bar and had dinner. It had been an idyllic time. I had breakfast in the café, then crossed the beach and climbed the low rocky headland opposite, that the locals call the Sleeping Dragon. I sat for a while looking out to sea and then I made my way along the ridge of a sand-dune to the cave where I planned to scatter some of Chris’s ashes. There were wax tapers for visitors to use in the tiny church. I lit one and left it burning beside a photograph of Chris that I’d taken with me. Outside, in the cave, I found a sheltered spot overlooking the bay and mixed a few handfuls of Chris’s ashes into the dusty soil. As I did so, I felt a sense of joy and a rising energy in my body that told me this had been the right place to start. By this time it was mid-morning and the sun was blazing down. I retraced my path over the sand-dune and followed the familiar route along the shoreline to Trio Petra. It was a tough walk back (though I was determined to manage it without stopping). A cold beer, a shower, and a long siesta later, I sat in the shade remembering our time there together and wrote for a while. About 6.30pm when it was cooler and there were fewer people about, I changed and went down to the beach. 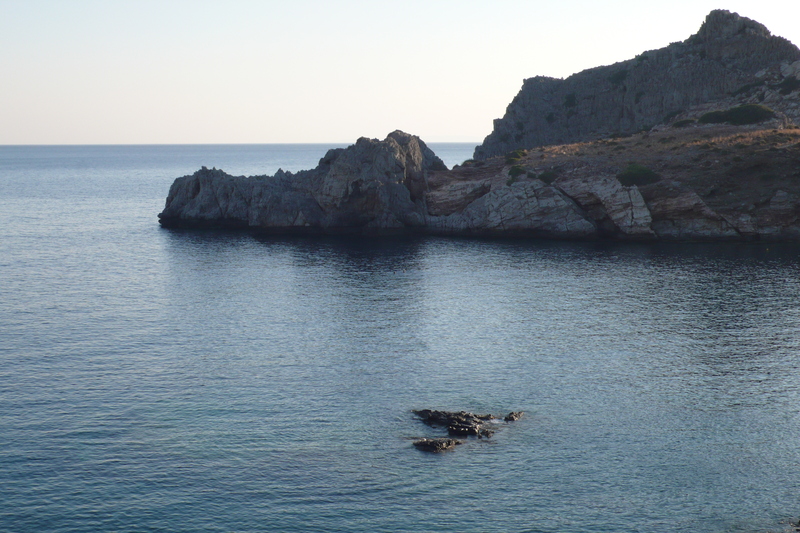 The water felt silky smooth on my skin as I swam out over the rocky shallows to deeper water. The poem I’d written that afternoon, had made it clear to me that this was where the remainder of the ashes I’d brought with me belonged. I unscrewed the top of the jar underwater and, through my goggles, watched the cloud of grey-white particles drift down and away on the current. The first stage of our journey was done. I brought you here for your 40th birthday. Do you remember? You were mad for the sea. Swim, you said. Swim with me. but deep water was your element. There’s nothing to fear, you said. I won’t let you drown. and shafts of sunlight dissolved into darkness. And I was not afraid. I took your hand in mine and said, Let’s jump. Yes, you said, let’s do it. as we knew it would. and I am slowly heading back to shore. Our guide Eleni and I decided that it would be more comfortable (and much more fun) to be standing up in the back of the truck rather than sweltering inside the cramped cabin with the other passengers. Our driver whose name was Adonis (yes really) snaked the 4×4 down Mt. Psiloritis, edging us close to the drop on what seemed like 100 hairpin bends. We had the wind in our hair and a grandstand view of the trail winding down the tallest mountain in Crete. A group of us from Friends of Amari had spent the day visiting a Cretan shepherd family. For six months of the year they live with their flocks of sheep and goats on their traditional pastures, about 2,000 metres above sea level. They’ve got mobile phones, they’ve hidden their guns, and they’ve replaced their donkeys with trucks but those are about the only things that have changed since their great-grandparents’ day. As we watched, Yorgi – the indestructible pater familias – stirred a cauldron of fresh sheep’s milk as it heated over a wood fire. In the course of an hour, an age-old alchemy transformed the liquid into cheese: first the Graviera which matures in 50 days to the consistency of Gruyere, and then the Ricotta-like Myzithra, served warm with honey. We joined the family for lunch. Yorgi, his son-in-law Costis who didn’t move from his chair during our whole stay, Irene who cooked and served and didn’t sit down once, and their teenage daughter Asteroula who – when she wasn’t helping in the kitchen – spent her time playing with an 8 week old baby goat. And then came a visit to the holy of holies: a dry-stone pyramid secured by a thick steel door behind which were locked the aging cheeses. I crawled on my hands and knees along the low entrance tunnel to select a specimen from the serried ranks of cheeses on parade in the dark. Strictly speaking, the shepherds were not allowed to sell their produce because it’s not made in conformity to an EU food safety standard designed for industrial scale production. Ironic really, since the shepherds and their forbears have been making and eating it without causing any harm to anyone for centuries. 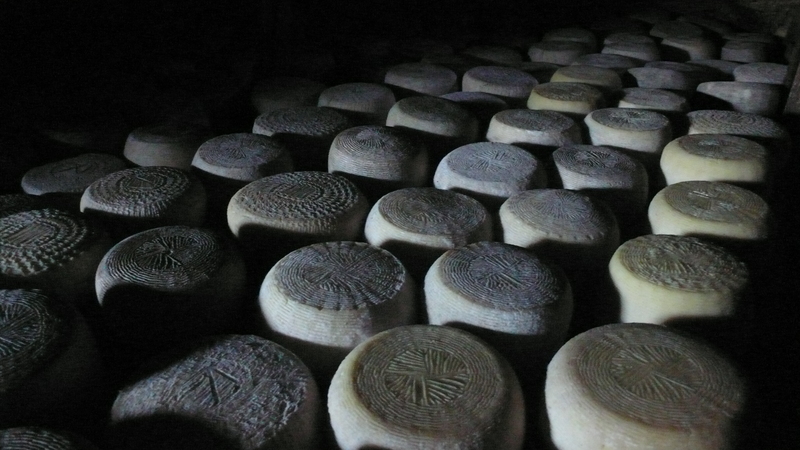 Cheese-making for this family was not so much a way of making a living, it was a way of life. A way that they wanted to preserve; a way that unthinking bureaucrats in Athens and Brussels, with the best of intentions are steadily destroying. Instead of being encouraged to develop a market for their premium-grade artisan cheeses, they are bribed to over-graze the land by EU subsidies that literally get eaten up in excessive bills for animal feed. Because of this back-to-front logic, there’s not a shepherd on the mountain who isn’t 1000s of Euros in debt to the banks. Now, some kind of eco-friendly tourism may be their only hope. The shepherds’ way of life – close to the earth – is one that we can learn from. It’s worth preserving (though not without change). Perhaps the best of the old might combine with the best of the new: Costis might stir from his seat; Irene might not feel obliged to adopt a subservient position; Asteroula might go on-line to study for her university entrance exams; and the flocks still be cared for and the cheese still be made in the traditional way. At it’s best – as a friend said to me this week – tradition is not about preserving the ashes of the past but about passing the fire on to future generations. In any event, I thank the shepherds for an experience of the mountains I shall treasure and for a day I shall long remember. Their quiet dignity and limitless hospitality stole my heart and I wish them well. Today marks the beginning of a new phase in saying farewell to Chris. To explain why, I need to go back to October 2014, after she had been discharged from hospital to spend her last few weeks at home. “What are you going to do with my ashes?” she asked, sitting up in bed. “What do you want me to do?” I countered, playing for time. She’d already told me that she wanted a quiet funeral followed by a bang up celebration a few months later. I could manage that but I couldn’t bear to think of her reduced to a few kilos of dust. We made plans for the celebration but I put off the conversation about when and where her ashes would be scattered until it was too late. In the end, I had to decide by myself what kind of journey it would be. Rather than a pilgrimage (with it’s connotation of a single destination) I settled on the idea of a peregrination: a sacred wandering reminiscent of the old Celtic monks, like Brendan, who called themselves “peregrini” as they voyaged the western seas and made landfall on mythical islands. For them it was their experience of the journey that really mattered rather than reaching a pre-ordained destination. I realised that I too must let go of fixed expectations and travel mindfully, open to whatever happens. Which brings me back to where I began. I’m writing this in the departure lounge at Gatwick Airport waiting to board a plane to Heraklion. 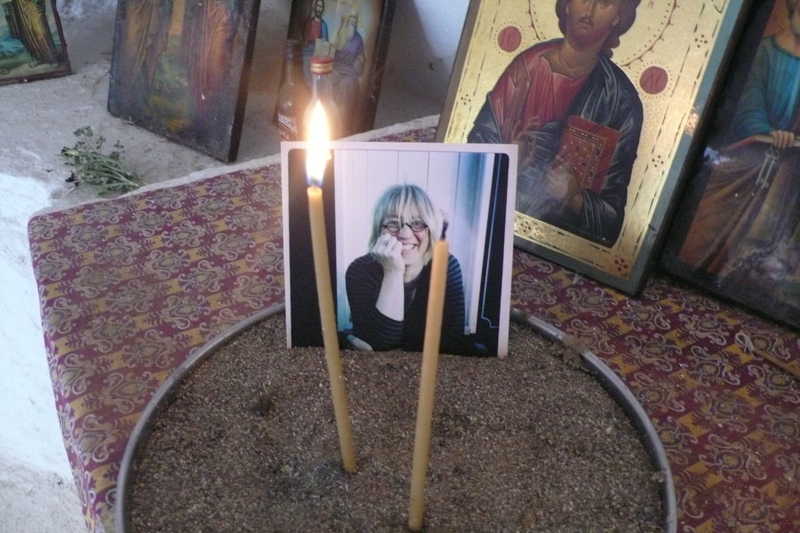 In a few days time I’ll be at Agios Pavlos on the south coast of Crete, the first of many places in UK and abroad where I shall return Chris’s mortal remains to the earth. Later this year, I’ll be going to Puglia, Italy. Next February, I’m planning a trip to the Masai Mara in Kenya; and in June a North American tour of Long Island, San Francisco, Esalen, and St Miguel de Allende. In most places there are particular friends to share the occasion; in some, Chris and I will be alone with our memories. In my backpack is a plastic, screw-top jar containing some of her ashes. I thought it might be a problem to take human ashes with you on an airplane but it turns out that as long as you have the right paperwork, it’s relatively straightforward. It’s good to be travelling together again. They’ve just called our flight. Just over a year ago – 30 May 2014 – Chris and I saw The Wind Rises at the Watersmeet Cinema in Bristol. It was Miyazaki’s swansong, the last great animé film he directed at Studio Ghibli before his retirement. It was also the last film Chris and I saw at the cinema. A few days later her MRI scan revealed new tumours and our attention turned to other things. I watched it again last night on DVD on my laptop, in the campervan with Teddy at my side. Chris and I thought the film was stunning when we saw it and it was just as good the second time around. The characters are far from heroic and their story is quietly underplayed. It’s undoubtedly a masterpiece and about as far from a Hollywood blockbuster as you can get. Set in Japan in the 1930s, the story centres around aeronautical engineer Jiro Horikoshi and his struggle to create beautiful airplanes during turbulent, war-mongering times. He meets and marries his true love, artist Naoko Satomi but [spoiler alert] she dies young leaving him to continue his work. Somehow, I’d blanked Naoko’s death from my mind, so it shocked and moved me to tears all over again. 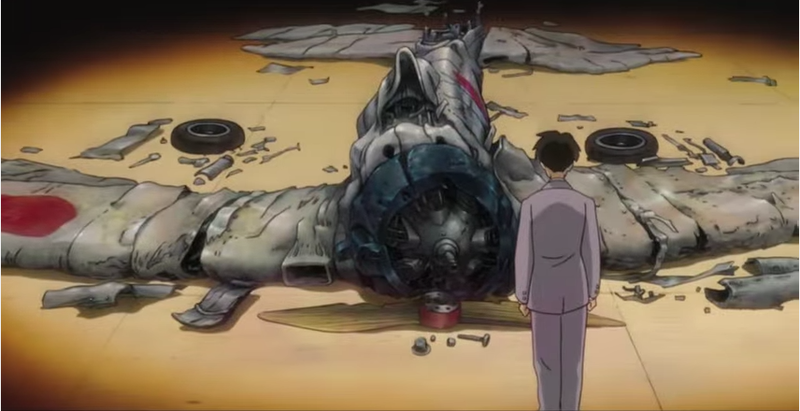 Looking back, the parallels with Chris and me are obvious (aeronautics aside); Jiro and Naoko’s fate seems now to have been a portent of how our lives would unravel. But the film is not without solace. The clue is in the title which comes from a line which Jiro and Naoko speak to each other, taken from the famous poem by Paul Valéry, Le Cimitière Marin. Written in 1920 in the immediate aftermath of the slaughter of the First World War, a seaside cemetery provokes the poet into a profound reflection on mortality, before the thrill of the salt-laden breeze and the crashing surf remind Valéry of his own vitality and call him back to life. The wind rises! . . . We must try to live! 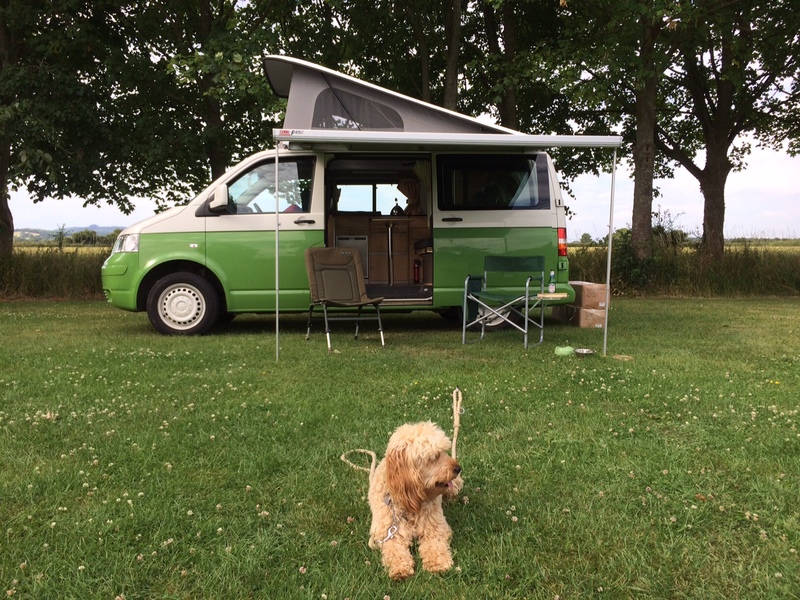 Meet Rosie the campervan (aka the Lovemobile) and Teddy the Wonderdog. Rosie should really be called Plastic Rosie, since a string of them – bought in an Amsterdam flea market – festoon the dashboard, but that would be a bit undignified. Chris and I bought Rosie in October 2013 as an early wedding present to each other (the only accommodation we’ve ever jointly owned, as she pointed out rather acerbically). As with so many good things in our life together, it was her idea. We started out by taking a rented classic Volkswagen T2 to Padstow for a weekend. Fabulous to stay in on the campsite. Steered like a drunken pig on the road. “No way will I drive one of those things across Europe,” I declared. But when we got back to the depot, I noticed Rosie up for sale. 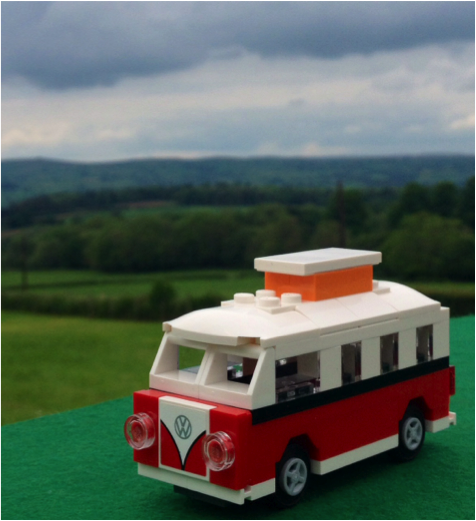 A five year old Volkswagen T5. Two careful owners. Low mileage. Lovely specification. Perfect condition. Well under £30k. An hour later and the deal was done. A phrase involving the words smart-arse, remember, and no one likes a, came to mind but remained unspoken. Then came the fun of making her ours with new bedding, pots and pans, mugs and plates, knives and forks, etc. Pride of place went to the Lego mascot given to us by our friend Christopher Goscomb. We managed a week away in Derbyshire at Easter (with Teddy who was then just five months old) and a few long weekends before the summer, when we expected to spend the whole of August in France. Those plans were abandoned when Chris fell ill last July and Rosie has sat motionless on the drive, attracting envious and admiring comments ever since. So, this summer, Teddy and I are heading off in Rosie on the trip that Chris and I never made. A whole month in Brittany for snoozing in the sun and gentle walks (both of us) writing and drinking wine (me) barking and chasing the girls (Ted).